In college, I could stay up late with the best of them. Two a.m., the Acorn Cafe, and I were very good friends. On occasion, I even hung out with Great Oaks Hall and the elusive all-nighter. Not so anymore. These days, my eyes are drooping by 10:00 p.m. Baby J is a good sleeper and will usually sleep all night, but in the last two weeks or so, her sleep time shifted from 10:00 to 11:00 to 11:30. After a discussion with our pediatrician, we are moving her bedtime up to 8:00, and so far this seems to be working. I don’t need to go to bed as soon as Baby J is asleep! This has been great — I can stay up and knit, play a game, or watch a show with my husband. It’s a double-edged sword, though, as I get addicted to the time, and I end up staying up later than I should. Last night is the perfect example. Baby J was asleep and in her crib at 8:00 p.m., my husband was playing Battlefield 1 with friends, and I had a date with a sock. I am not typically a monogamous knitter. I love to cast on whatever project grabs my eye. Yes, sometimes this means that projects don’t get finished for a year or that they eventually get frogged (ripped out so the yarn can be reused). But for me, the joy of knitting comes from the process: finding a pattern, discovering a beautifully dyed skein of yarn, casting on, and knitting (not always in that order). These socks, though, are for my husband, and he is patiently waiting for them to be ready. Because he is paying attention to what I’m knitting, he would notice if I switched projects. So I need to finish them. Because I want to KNIT ALL THE THINGS. Thus midnight and met once again. One sock is completed, and yesterday at Knit Night, I made great progress on the cuff and had even started the heel increases. So after Baby J was asleep, I went to town on these socks. By the time 11:00 p.m. rolled around, I was so close to being ready to turn the heel that I had to keep going. I should have stopped. The later I stayed up, the more mistakes I made. This row was off by one stitch. That pattern didn’t quite line up. You get the idea. I felt like Tina from Bob’s Burgers, but with the enthusiasm of her sister Louise. Fortunately, I made it through without needing to frog any of the work and was able to drop down one or two stitches to fix my mistakes, but it takes longer to fix the mistakes than it does just to knit! I made it to about four rows before the heel turn, and in the process, I qualified for the Night Owl Knits badge for the Eat.Sleep.Knit Yarnathon Booster Club! 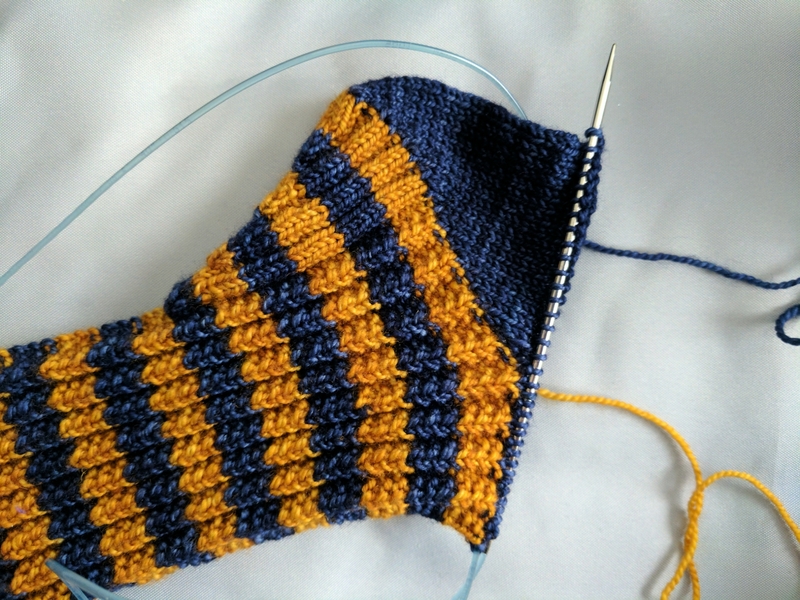 This morning during Baby J’s first nap, I was able to finish the heel turn! Now for the foot of the sock. I WILL finish these this weekend so I can knit all the other things!